In the December 2010 issue of Radio Recall, Jerry Haendiges discussed a study coauthored by Sam Brylawski and Rob Barnberger of the Library of Congress, relating to the preservation of sound recordings in the United States. Jack French then asked John Reiser and me to read the study and provide comment. John will cover the more technical side of this issue and sound preservation at our April meeting, while I would like to address the intent of the study. My first reaction to reading the introduction of summary of the study was that the authors were concerned with the possible loss of historical recordings in this country. Although they showed some concerns about the loss due to the media used to make the recordings, they seemed more concerned with the actual copyright laws that restrict the ability to preserve sound collections. Interesting. Especially since these words are coming from an employee of a government agency. Another part of the study deals with the formats on which the material has been recorded. Whether the current digital formats will last as long as the analog formats have lasted. The need to educate those preserving audio, as to how to backup and move material from an old format to a new format. The list goes on and on. As I read this, I felt that here was a very frustrated individual who wanted to save everything that he considered of value, but was restricted because of copyright issues, formats that were changing, archivists who needed to be educated and the lack of any kind of standard within the area of those who were preserving and restoring audio history. This is a far cry from a study on digital media failing to preserve audio recordings. Looking at the study from this view, one can understand his frustration. But, how does this affect us, the old time radio show hobbyist? Our concern is “will what I record on tape or CD or hard drive or whatever, still be able to be played 10, 20 or 30 years from now.” I didn’t see that direction taken in the study. Taken out of context, this would seem to imply that CD-Rs are not reliable. Actually what the study is saying is that the CDs must be properly stored and over time duplicated so as to insure their ability to last. Nothing lasts forever. I have no idea who might have first said that. Obviously it is so basic that I can credit myself for thinking it up. But, I have stated it over and over again when I talk to clients, other video producers and groups of people who want to save their media to a format that future generations will be able to see and hear. Jerry Haendiges commented on the report by quoting a section and then giving his comments. I agree with most of what Jerry said. There are a few areas that found my personal experience to differ from Jerry’s. Let me address some of those differences. The study is quoted as saying “Those old analog formats that remain are more physically stable and can survive about 150 years longer than current digital recordings.” Jerry responded with, “Most recording tape prior to 1970 was made from acetate or prior to that paper. As anyone using these tapes knows, you kind of hold your breath when opening an acetate tape box. First of all, you are greeted with the strong smell of vinegar.” And Jerry then goes on to describe his experiences with tapes that have curled and not made good contact with tape heads. I got my first tape recorder in 1952. I was 13 years old. The recorder was a Pentron model 9T3C. I still have it and it still works. It uses pressure pads that apply a small felt against the tape to hold it against the record/playback head as the tape is being played. Most home tape recorders in the 1950's used pressure pads. Almost all professional tape recorders then and now do not. Pressure pads help prevent the problem that Jerry describes. I also have not experienced the problem of audio tapes decomposing. My biggest problem is having tape splices come apart. Only once did I actually have a problem with a tape decomposing. It happened about 10 years ago. I found a tape that I had traded with another collector. I wanted to play it and when I opened the box, probably for the first time since I had received the tape (the tape had to have been about 20 years old) all of the oxide fell off the tape. It was the darndest thing. I opened the box and picked up the reel and a lot of powder started falling off of the tape into the box. When I tried to play the tape, all I could hear was a jumble of sounds. This was the only time I found a tape in this condition. I have no idea what the tape brand was since it came in a white box. My first reels of audio tape where Scotch 111. Those tapes are still playable today. In fact the only problem I’ve ever had with brands of tape was some reels of Ampex tape. I think it was the back coated tape. Some of those reels squeak when played today. I’ve tried the baking process on a few of them and that seems to help. Sorry Jerry. Although I don’t think we have ever met, I have the highest respect for what you have written in the December issue of Radio Recall and for what I’ve read of your comments in the digest. It seems that there are some things that we have experienced differently. This is not to say that I would ever use the audio cassette as a means of archiving. But, other than the splice that holds the leader to the tape breaking on almost ever old cassette, once spliced, those cassettes do play. My problem with cassettes is the design of the cassette itself. The speed, the width of the tape and the width of the tracks just to name a few. It was meant as a simple means of audio distribution, not truly professional mastering or archiving. And yet, that simple little cassette provided me with a good income for a number of years. I use to duplicate about 80,000 cassettes a year back in the 1980's. Strangely enough, those cassettes don’t seem to be troubled by squeaking. It may have to do with the tape speed and the fact that all cassettes have pressure pads. Jerry also mentioned how the brand of CD-R made a difference. I completely agree with him on this. Cheap media can give you a problem. I’ve found this more of a problem with DVD-Rs than with CD-Rs. Maybe that is because I always bought major CD brands and stayed away from the store brand. However, when I first started recording onto DVDs, I at one time used the Ritek brand DVD-R. I soon found that masters I had made on Ritek DVD-Rs became unplayable about two years after I burned them. After trying a number of different brands, I finally settled on Verbatim DVDs. When it comes to CDs, I either buy Taiyo Yuden or Verbatim. But again, this is just what I personally found to work. DVDs seem to have more of a compatibility problem than CDs. To sum this up, re-read Jerry’s comments in the December issue of Radio Recall. Except for the two or three areas that my experience found to be different, I stand behind his comments. Now, to sum up this discussion...the Library of Congress study is not really aimed at the OTR collector. It does make a very good point about problems copyright, the need of good databases to locate historical audio, the need to understand the equipment that one is using and the importance of saving audio history. The motion picture industry is going through these same problems. Which is another area that groups of collectors are dealing with and struggling with similar problems that relate to OTR collectors. 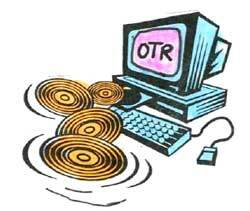 So for now, what does the OTR collector do? Well, if you are luckily enough to be a member of the MWOTRC and since you are reading this you probably are, the April meeting will deal with this subject. Stay tuned for more information. Until then, don’t throw out those CDs or cassettes or reel to reel tapes or even those MP3 files. As I said at the beginning of this article, NOTHING LASTS FOREVER. It may just be that when your reel to reel machine stops working, you’ll be able to listen to that show on a cassette tape that you happened to dub. Or that MP3 file that you made for your Ipod is the only copy that you can find of another favorite program. There are almost always solutions to every challenge. It is just that some solutions are not as easy as others.